We have sent our products to the most demanding magazines in the country to be put through their paces. After all, why take our word that we are the best value wet suits and watersports company in the UK when you can listen to what independent test reviewers have to say. The Vector goggles from Scottish watersport specialists Lomo are the cheapest on test, but you wouldn't know it. with a strap that splits at the back, and you adjust the tension at the sides, which is simple and stress-free. 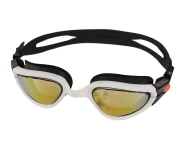 but the majority will find thy're versatile, no-nonsense training goggles that won't break the bank. Great value, comfortable trainers that will suit most swimmers. Why would you? Our cost £10 and scored 87%! crashing through the Indian mountains. And i was seriously impressed. A shoulder carry strap would be nice. with faces of all sizes, for regular pool and open water use. 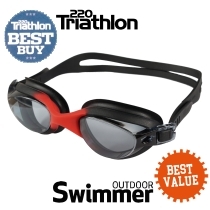 A fantastic value pair of goggles just lacking polarized lenes. We tested the Lomo first and it was impressively flexible around the shoulders while offering huge body lift to those completely new to tri. It's only when we tested the other suits that its mass of neoprene felt unrefined. Yes given it costs about £100 to hire a suit for a season we'd have no qualms recommending this to triathletes, even if Lomo's direct selling ethos goes against out 'try before you buy' mantra. Out of the box and the Challenger seems a touch agricultural, feeling heavy and featuring few visual flourishes. So is it a false economy or a fish through the water? Into the Atlantic and it's certainly warm (Lomo hail from Scotland, after all), although there was a little chilly water ingress around the neck and sleeves when the conditions became rough. 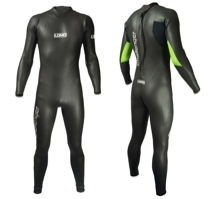 In terms of buoyancy, the sizeable 5mm Matsuda neoprene body and bottom thickness felt like it would've kept an Iron Man afloat, let alone an Ironman athlete, but the surprise here was the generous flexibility provided by the 1.5mm underarm panels, something we factored wouldn't exist at this price. It was easy to get out of and chafe-free, although not much fun to run in if you have long transitions. Huge buoyancy and warmth, and surprisingly flexible for the price, too. Emergency Shelter, or bothies, are nothing new but they can be a godsend on an exposed hillside, especally in the winter, should a problem arise. Most are effectively a waterproof nylon bag with a draw cord that's pulled over head of a few people - basically without poles - but its amazing how much heat is suddenly retained in your little haven out the wind. At just shy of 20 quid, Lomo's version is around two third of the cost of the competition and is excellent value. It rolls up smaller than a waterproof jacket, so a mid-sized hydration pack will easily swallow it,and it takes seconds to both pull out and pack away again. Once deployed two people can easily get in and a third could get into the middle in an emergency. The heat retention is amazing, especially if the drawcord used to really seal things up. Two adjustable 'snorkel' vents in each wall ensure it doesn't get too stuffy, and a clear window allows you to see outside. To finish off there are a couple of reflective panels - handy if a search team has been sent out to locate you at night. It may look a bit daft but if you regularly stray off the beaten track this should be essential kit for your pack. These 3mm neoprene gloves from watersports company Lomo are the cheapest of the gloves we tested. Designed specifically for open water swimming, they also feature glued and blindstitched liquid seams. 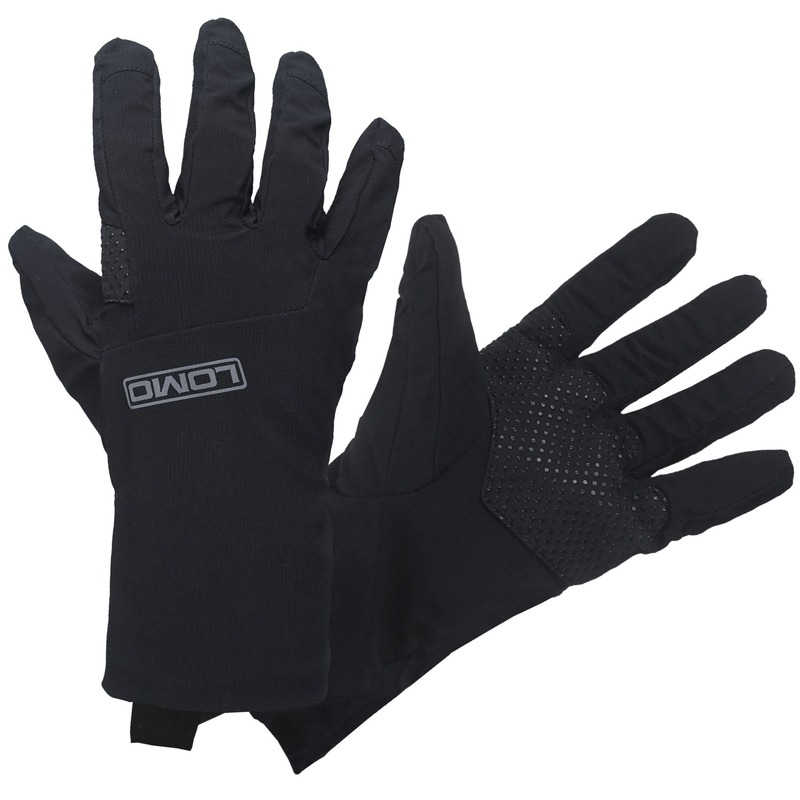 The short cuff has a gasket seal that fits the glove tightly to the wrist. 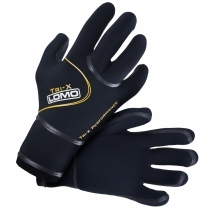 Although the Lomo gloves are more bulky in design then some of the other gloves on test, they scored highest for warmth of all gloves we tried. "Excellent for warmth but a little bulky, although I managed a good fit following some adjustments. 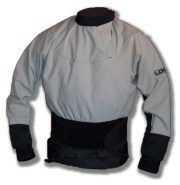 All seams are glued with a very good wrist seal, so will suit swimmers without wetsuits. Some feel for the water. Buy smaller than recommended for best results. The best value gloves on test. 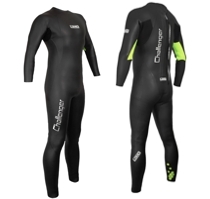 Perfect for winter swimmers venturing out in very cold water. Note From Lomo. Since This review we have adjusted the size chart and now believe people should not order smaller than recommended. 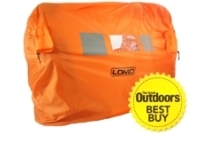 Lomo is a watersports company and this shelter is their first venture into general outdoor gear. I must say it's a really good start. The shelter will hold three, which makes it comfortable and roomy for two. The weight is reasonable for a three person shelter and the price is low. Two vents makes for better ventilation than one as there is some airflow through the shelter. The vents don't have mesh ends but can be almost closed with drawcords. The windows are OK until they steam up. I wouldn't choose this for solo use but for two to three people it's excellent. A separate compression stuffsack is provided. It weighs 29 grams. Stuffing the shelter back into it is difficult as its a little too small. The shelter doesn't need a stuff sack anyway so i'd ditch it and just stuff the shelter into the rucksack. Note from LOMO. Our shelter won the category against stiff opposition from big brands that were all more expensive. The headline feature of the Lomo Challenger is clearly its price point. The £89.99 causes a double-take moment, leaving you wondering if a digit is missing from the tag. Constructed from smooth-skin neoprene, it still offers a performance that's comparable with suits costing twice or even three times as much. Admittedly, the cut is generous, meaning you may end up going one size down from normal to find a snug fit ( the downside of that price is Lomo are a direct online seller, so you'll have to travel to Glasgow to try before you buy). The shoulder flexibility is adequate but certainly in a different league to cheap surfing suits you'd otherwise be limited to in the sub-£100 category. The design is very simple, with neon green underarm panels added for 2014 to give it a touch more style than previous years. It's only 3mm neoprene at its thickest, but the bouynacy is acceptable. Sport Diver magazine did a new comparative test of masks below £30. They compared masks from major manufacturers. Our mask was given a BEST BUY award. Mark: The Nitro was an awesome little mask from Lomo, and the Vapour continues this trend. Like its predessor, it looks and feels far more expensive than its, and you even get a sturdy plastic box thrown in too! Comfortable skirt. Easy to clear and decent all-round field of vision. Paul: Good all-round view, comfy skirt and a great price - what more do you want? I initially found the squeeze-release clip a bit awkward, but after a couple of uses the system worked well and was easy to adjust. Good-Looking Mask. Thom: Comfortable mask, which was easy to clear and offered a good field of vision. Like Paul, initially struggled with the strap clip, but once i'd used it a few times, i actually found it very simple to use. Great value for money. 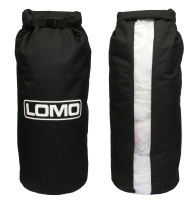 Although Lomo are engaged primarily in the water sports industry, their dry bags are proving very popular among our readers. Thats probably down to reconising the fact that if it's used in nautical pastimes then it s assured to be waterproof and because it's not logoed with motorcycle related labels the price on the swing tag is certainly more attractive. This dry bag is a top opening roll bag, which for me is more preferable than a side opening (duffel) bag, because it is easier to pack/un-pack and particular items can be located with out having to pull out the entire contents to find them. 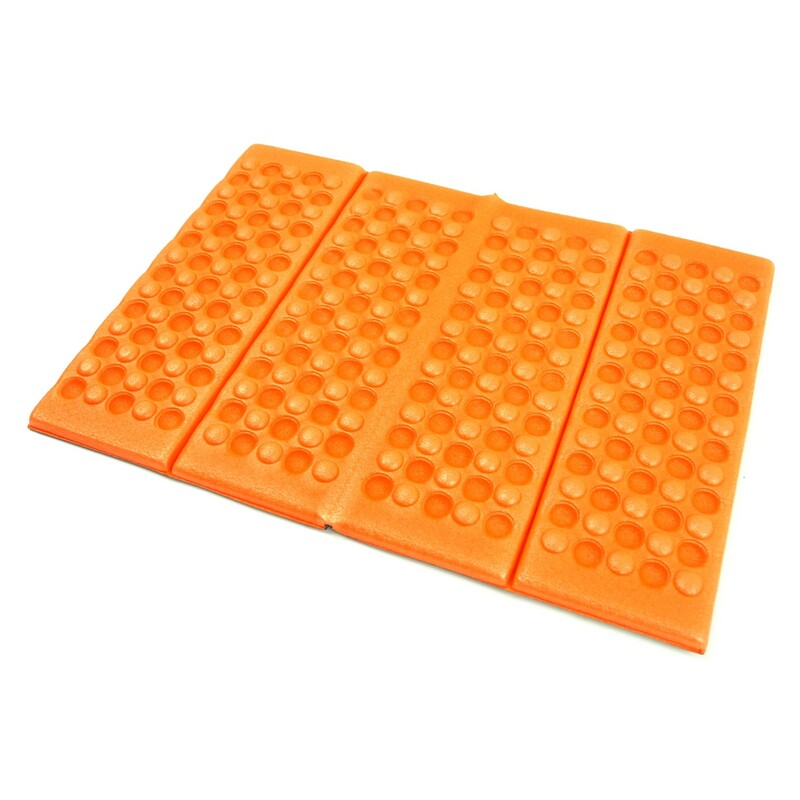 It is made from highly abrasion resistant and waterproof polyurethane (PU) coated nylon. All the seams are welded to ensure that there is no possibility of them them leaking. The roll down is fastened each end with clips and there are lateral compression straps that secure the contents. With the brushed material it gives a certain amount of grip when placed on the bike and your securing bungess or straps are less likely to slip off when lying down. 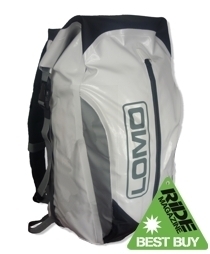 It has a two piece carry handle and a detachable shoulder strap for easier transportation away from the bike. In a line: A roll bag pure and simple and good value for money. Perhaps it something in the gene pool or maybe a consequnence of the upbring in the cold, far north of England that i'm one of those fortunate divers who doesn't usually feel the cold and can dispense with the need for gloves under normal circumstances. Even in the winter months when others are donning their dry-glove systems, just the action of holding and operating my camera equipment underwater seems to be enough to keep the blood circulating through my fingers. Gloves do of course have their uses for protection, when entering and exiting from shore dives or navigating around a particulary jagged wreck for example, but generally i'm happy to dive without them. On the other hand there are several divers i know of who would rather abort a dive than go without their hands snugly insulated against the elemets. For those and other similarly afflicted divers, the chilly waters surrounding the UK mean thick neoprene gloves or mitts are as essential as a piece of kit as the air that they breathe. The west coast of Scotland is one destination that offers a combination of top-class diving with a shock to the system for those not used to diving in the colder extremes of our island nation. Thankfully, Glasgow's Lomo Watersport have a range of warm, comfortable gloves available do divers can be safe in the knowledge that their time underwater can be enjoyed with their digits enclosed in relative warmth. Made from high quality neoprene with glued and blind-stitched seams, these all black, 5mm gloves have a contrasting grey honeycombed rubber printed pattern for superior grip, plus an elastic velcro strap to prevent cold water flushing. They're exactly what the west coast divers need to stay cosy and warm, you'd think, but Lomo's Mark Lowery found his customers still required something a little different. As the customer is always right, Mark duly obliged and now the same product is available - in high visibilty yellow! My initial response, and that of almost every diver was 'Yuuuk!'. However, once over the 'You'd never get me wearing a pair of those" Reaction, it was closely followed by an appreciation of the simple logic behind the idea. Even in today's advanced technological society, we divers still predominantly communicate by hand signal, so why are the majority of diving gloves black? Think the benefits of communication with the hi-viz yellow version: for instructors signalling to trainees; a dive guide directing his or her charges or buddy pairs navigating in murky conditions. Boat skippers would also have a much easier task of spotting a diver at the surface giving the OK for pick-up or, More importantly, a distress signal in an emergency. Will they take off and become a commom sight among the diving community? That shouldn't be too hard to monitor, as they do tend to stand out like the proverbial sore thumb - exactly as they're meant to. Well made and inexpensive, these brightly coloured gloves are comfortable, warm and remarkably dextrous despite their 5mm thickness. If you're teaching, guiding or intending to dive in potententially murky water they will definitely improve your visual communication. 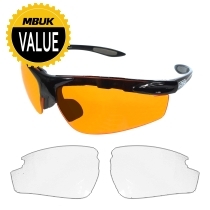 Yes, you've read that correctly - just 10 pounds for a pair of cycling glasses. In all honesty, we shouldn't be surprised. We've tested Lomo before, albeit their aquatic range, and the RRPs are staggering (they currently sell a 4mm/5mm wetsuit for £65.00). But surely the quality is as low as the price? Not at all. The wraparound style, to protect your pupils from insects, sit nicely. However, the combo of our large schnoz and rigid nose bridge meant we'd like it to have nestled a touch lower. It wasn't uncomfortable but it did mean you could see the base of the lens. 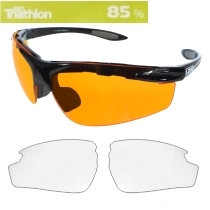 The Elites come with two lenses - orange for the sunnier climes, clear for cloudier. These were easily swapped over, though its next incarnation should benefit from a darker lens for truly bright conditions. They're billed as cycling glasses but performed impressively on the run, too, not fogging up like many of their more illustrious rivals. For £10, they're an absolute steal. Lomo are undeniably the new kings of budget sunglasses. The flexy plastic frame of Lomo's Elites glasses will endure a bit of rough treatment and can be stowed without worry in your pack. Mark at Lomo Watersport was keen to get me to try this new range of gloves and i have tested them thoroughly in recent weeks. There slight difference to these gloves which as far as i know no other manufacturer provides. They are made from comfortable neoprene and are 5mm thick - Great for scottish diving. They have a simple elasticated velcro wrist closure that does not get twisted or caught in a buckle - which is great. The seams are glued and stitched and these held up well after some really rough diving with only a couple of stray threads appearing. The palms of the gloves are covered in an area if hoenycomb shaped grips. 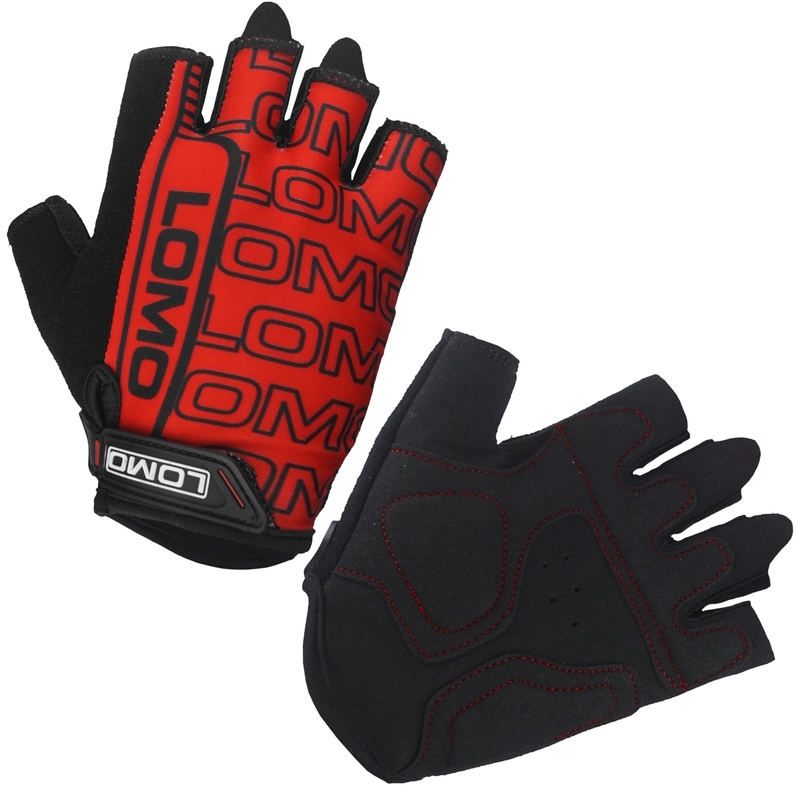 So you may be saying what is so different about these Lomo gloves? Well these gloves are made out of high Vis Yellow neoprene. The intention is to improve the visibility of underwater signalling between divers. This is certainly the case. Another bonus is found on the surface as boat skippers confirmed they could see the gloves over half a mile away. So in respect of this they score top marks. I showed the gloves to divers on a couple of boat dives and the general view was they were very comfortable. They may or may not be of interest to the all black kit technical crowd but i think their benefits should not be overlooked. I was however on a boat with an extremely fashion consious ex-BDO of a ScotSAC club - for arguments sake lets call him Nig*1 to protect his full identity. He came out with a super quote 'what about colour coordination' LOL as he donned his PINK fins. It was a great gag, well delivered. So will we soon see divers wearing yellow gloves, well I personally think it makes sense, especially for remote or tidal diving, never mind the murkier waters of the UK. The gloves cost half the price of a normal set retailing from Lomo Watersports at a very reasonable £12.50. Sport Diver magazine did a comparative test of masks below £30. They compared masks from major manufacturers. Our mask won the comparison test and was given a BEST BUY award. Mark: Excellent peripheral and downward fields of view. Solid build quality, and comfortable silicone skirt. Absolutely bargain at this price. Decent strap system. Reece: This mask offers a decent fit, and lets in plenty of light. it offers 20-30 percent better field of vision than some of the others in the test. Downward view is particularly good. Quite a large-volume of water in the mask, but still easy to clear. The Beaver Avenger, Beuchat Voyager and Lomo Nitro went head-to-head for the title of Best Value, but the Nitro emerged as a clear winner. The Voyager and Avenger are decent budget masks, but the Lomo is a wolf in sheep's clothing. The build quality belies the price tag, and to look at it, you would expect it to retail for at least the mid-£30 mark. It probably would, too, if it wasn't only available direct from Lomo. This mark faired well in our Long Term Test stable, and it shone again here too. For the choice award, it was between the Oceana Yellow and Sherwood Oracle. Both had a very similar design, but the superior clip and strap system on the Oracle just saw it nudge ahead of the Oceana. A quality mask for a budget price. 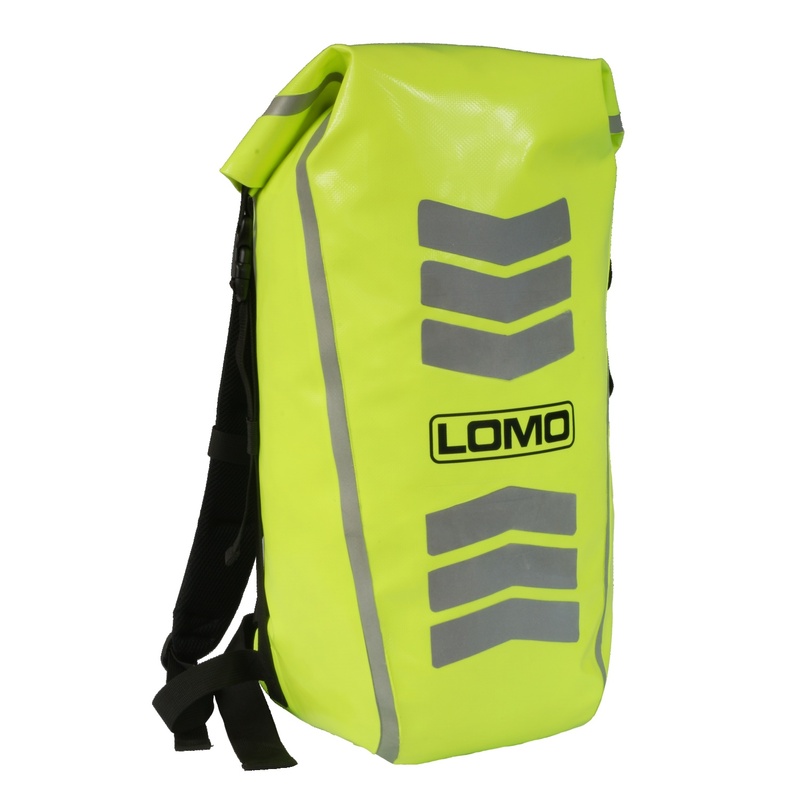 Marine manufacturer Lomo Watersport have launched another dry bag in their range of products for the motorcycle market. 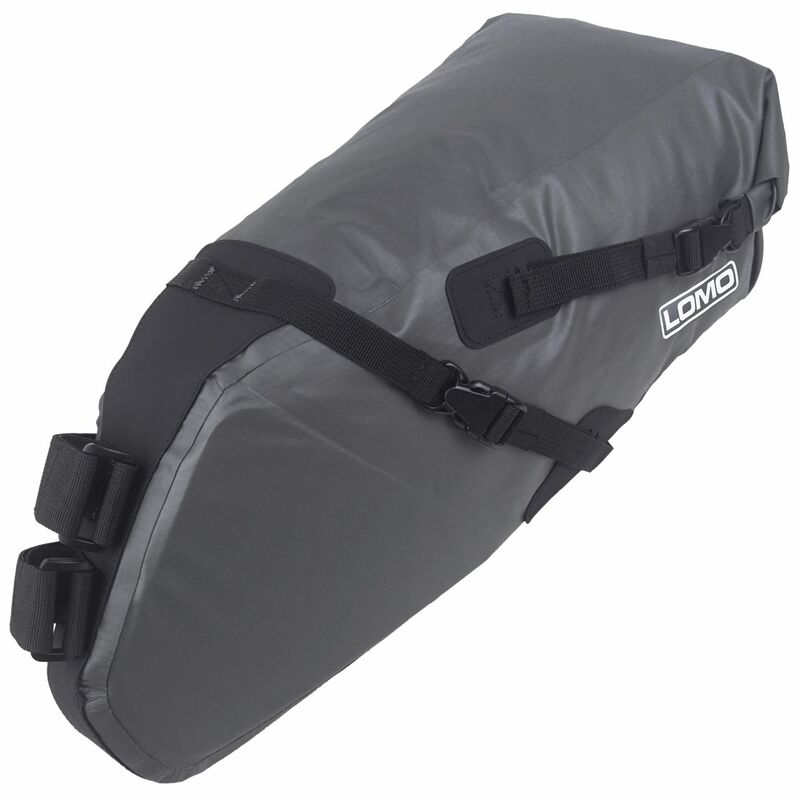 This 40-litre bag is shaped in a familiar 'roll-top' dry bag style, but Lomo have added a unique handle system to the top of the bag which incorporates both a handle and several webbing loops which allow either straps or bungees to pass through. The bag also has two carrying options when you reach your destination; a padded handle or a detachable shoulder strap. Priced at an amazingly low £11.50, it will certainly be a popular choice. It is available only throught Lomo's website at www.Lomo.co.uk. We've already praised several rolltop bags from Glasgow-based Lomo, and this is a fine addition to the range. 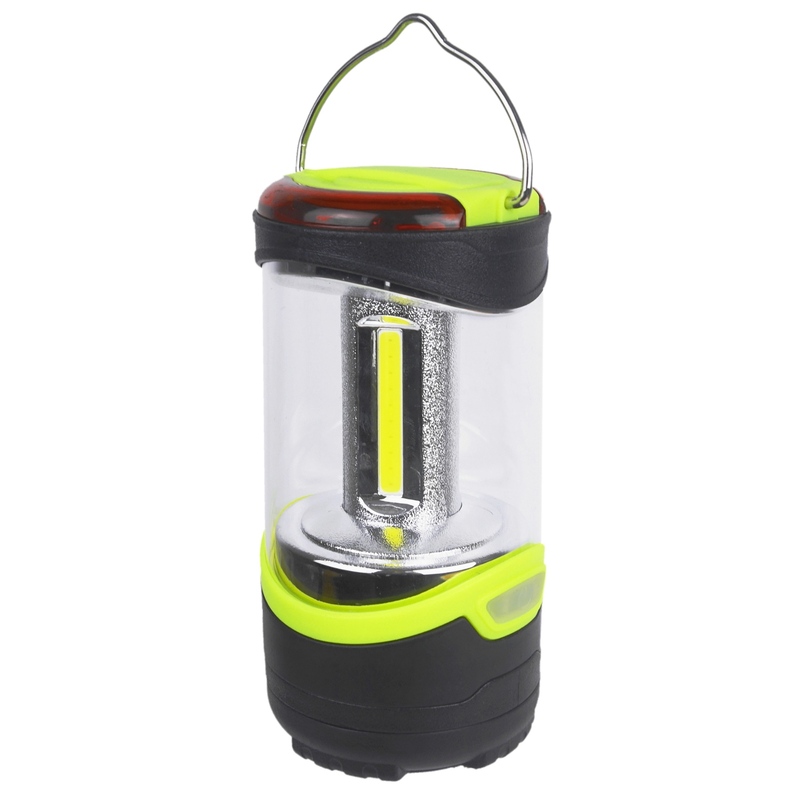 It's light, tough and waterproof, and its 40-Litre capacity is a useful size. It has a neat new combination of handle and webbing loops to make it easy to attach securely to your rack or back seat, but can also be carryed with a detachable shoulder strap. Exellent Value. Our Raptor Diving Fin was review in Sport Diver Magazine where is was awarded their BEST VALUE award. Mark: Absolute bargain. Big fin for little money. The design is a combination of a split fin and a paddle fin, with rigid sides and a soft middle section. Good performance with a normal fin stroke and a frogkick. Back kicks are possible, but quite awkward because of thier sheer sizes. Comfortable vented foot pocket. Dave: Cracking fin at the price. Good return of power for your effort, and manoeuvrable as well, despite their size. Comfortable foot pocket, A real Bargain. Will: Brute of a fin - like having cricket bats attached to my feet. However, while i personally found them a bit to long and ungainly, they did provide awesome power (as long as you have the legs for them), and are a good sturdy fin. 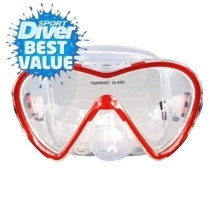 At £25 quid, they're a steal and would make for an excellent entry-level pair for a newly qualified diver. Verdict: The majority of the fins here performed well, and all of the test team argreed that they would have no hesitation in taking on an assignment with them. It just showed what a good set of fins you can get for under £50. When it came to the best value award, it was a battle between the Lomo Raptor and the Typhoon Pro II. Both fins are large paddle fins and give an all-round decent performance. Both come with mesh fin bags as well. However, in the end, the £15 saving between the raptor and the pro II swung the odds in favour of the Lomo, which is a cracking fin for just £25. There were a few more contenders in the choice category. The Beuchat X-Jet, Oceanic Viper and Scubapro Jet Sport all gave some great performances, and were in a similar price bracket. However, in the end, the Scubapro just edged out the competition by gaining the backing of all three testers for its looks, performance and comfort. 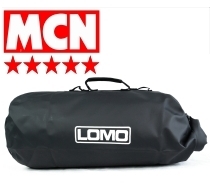 How Lomo manage to manufacture a bag this good and full of features AND sell it for such a low price is beyond us. This rugged tapaulin drybag has a decent-sized external pocket and a tough, comfy harness. 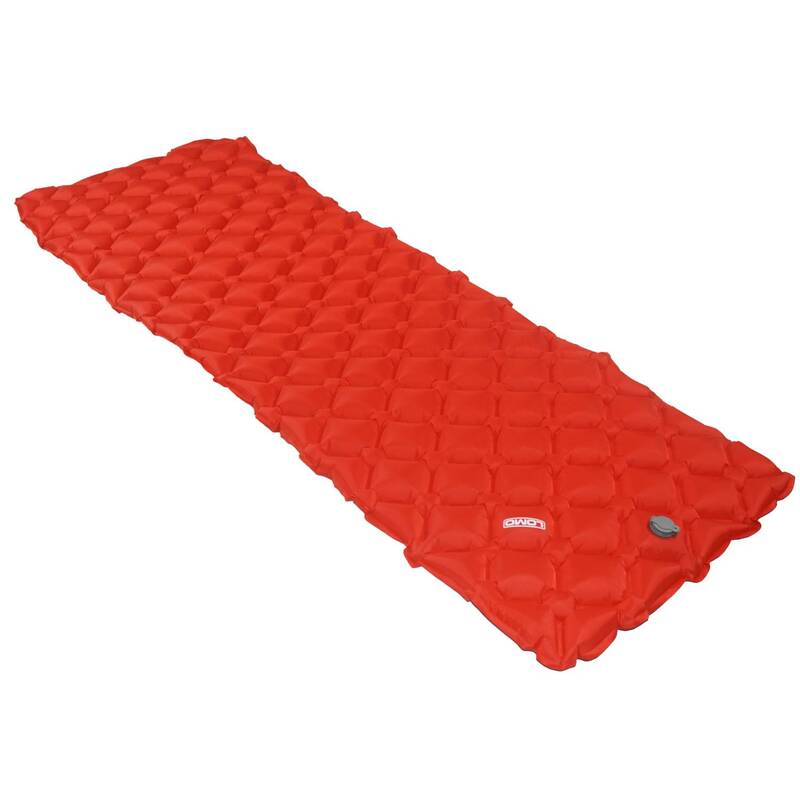 At first glance it looks identical to the Kappa item, but lacks the semi-rigid back board, with padded top and bottom sections instead, so some bulkier rigid items may prod you in the back. However, crucially it has a waist belt to spread the load and stop it shifting when you ride. Capacity is huge and it is genuinely waterproof. Our tester said: "Light, strong and comfy with a handy zip compartment that's big enough to keep wet gloves from your dry stuff. Our Nitro mask was included in Sport Diver Magazine's long term test where they use things for a long period of time to test how they preform. In the final week of the test they said this about the mask. recent trip to ST Kitts, and was immediately struck by the quality of the construction. It might only cost £17, but believe me when i tell you that you wouldn't bat an eyelid if i said it was worth over £35. Yes, it is that good. And you even get a plastic box, which is worth a fiver on its own! I am not really a fan of the teardrop-shaped masks that are all the rage these days, and like my old-school twin lens mask, but having said that, the Nitro is extremly comfortable, and i wish i'd taken it with me on my CCR course, as i'd have been able to see the head's up display on the mouthpiece!. At just £99, Lomo's triathlon wetsuit is by far the cheapest suit we tested. challenging times, perhaps change from £100 is just what your looking for. The black sheep in the test here is the Glasgow based brand Lomo, who sell direct to cut out the middleman and offer the lowest possible price. As a result, their Tri suit comes in at an astonishingly low £99, the cheapest on the test by some distance. 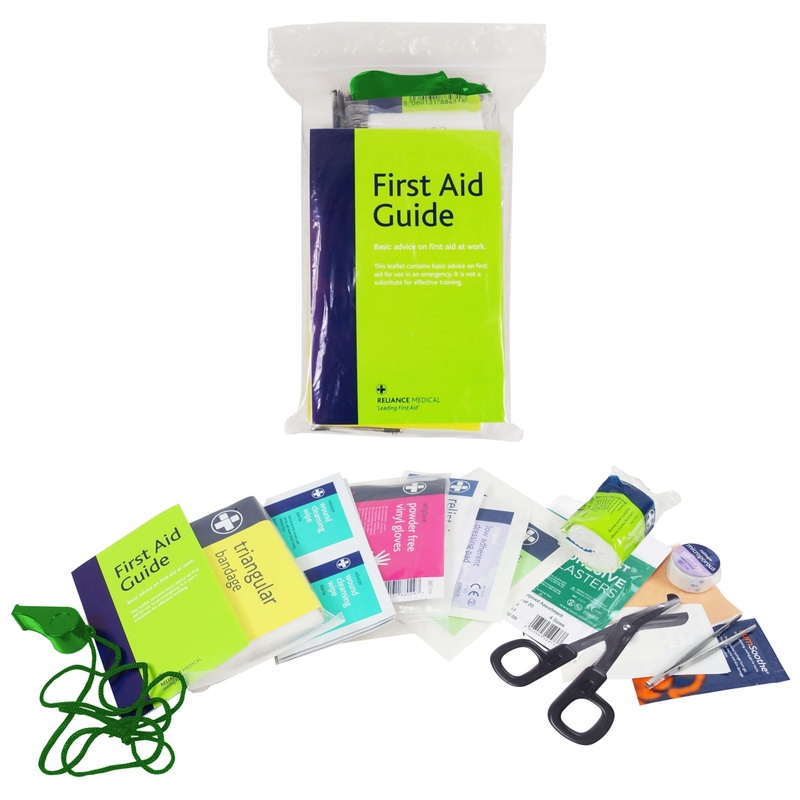 While the looks are plain and it lacks any specific ' features' - such as forearm catch panels- its well made from a lightweight, flexible neoprene using 3mm on the arms and a 5mm body. Performance wise the suit is heavier than the more expensive options here but this isnt hugely determental to speed in the water. The 3mm arms may be less supple than the 1mm or 2mm used in other suits but the Lomo is hardly restrictive. The cut is more generous than many of the more high end suits, which makes it less restictive in the chest area and easier to get on. In this magazine our Renegade drysuit won the VFM (Value For Money) award. LOMO manufacture and sell direct to the customer via the Internet or their own shops, so are able to be unbelievably competitive on price. The Renegade is built throughout from their Breathable Lomotex 4000 3-Layer Hydrophobic Material, with Cordura reinforcement on the knee, arm, ankle and seat areas. For a Suit of this price its packed with features including rear-entry Ti-Zip, complete with protective rear flap, a relief Ti-Zip, latex seals on the neck and wrists with adjustable outers for added protection. Latex socks and an adjustable neoprene and Velcro waist tube. We expected the LOMO suit to be good value, but the quality of the build and attention to detail on a suit of this type was excellent.The bright yellow wasnt all the testers cup of tea, but from a safety perspective, its great. Its clear that the team at LOMO have put time and effort into getting this suit right and in our opinion theyve done a rather fine job. Our only bugbear was the latex socks. Its a tough job being a sock on an immersion suit, grit, brambles, sharp rock, long toenails, and latex isnt renown for being the toughest of materials. Wed certainly recommend wearing an additional pair of neoprene socks over the outside to protect them. Apart from that we found this to be a comfy hardwearing suit that represents a lot of suit for your pounds. If youre on a tight budget, but still want to stay warm and dry during long days on the river and multi-day trips then the Renegade is going to be right on the money, so its no surprise that it takes our V.F.M award. Note from Lomo. Whilst we note the comments from the reviewers about Latex socks we find that the perception they are not durable is largely unfounded. In our tests latex socks have proved to be many times more reliable, watertight, and durable than breathable versions. Latex socks are also more expensive for us to use on a suit than breathable socks so if there was not a clear benefit from Latex socks we would move to the cheaper breathable socks. Furthermore if you put a hole in latex socks the user can simply repair them with a bicylce repair kit. Repairing a hole in breathable socks is not quite that easy! These boots were originally designed for diving but have proved to be particularly popular with sea kayakers. I could not believe the quality of these boots at this price. They are made of 5mm Neoprene with a zip that (unlike some more expensive competitors) has a 3mm gusset behind. The sole is thick and these boots are still comfortable when carrying boats down sharp shingle beaches. There is also good foot and ankle support for uneven ground. The open cleats on the sole provide security on soft slippery surfaces but do not hold grit (which some other soles can carry into your boat). Overall these are excellent boots for carrying heavy boats up and down a variety of surfaces on shoes and foreshores. These boots were very warm even when we had to break the ice at the edge of a sea loch. Size for size, they are a good bit bigger than some other boots on the market but my size 10 feet and boots fitted in even small sea kayaks. The zip makes pulling the boots on and off much easier than zipper-less ankle boots. the gusset behind the zip stops sand and grit entering the boot and abrading your bare tootsies or your goretex or latex booties. The boot was also high enough to protect the latter from the sun. There were no problems swimming. Even before taking price into consideration these are some of the best boots on the market. Not only that, they have now outlasted a pair of boots which were twice the price. 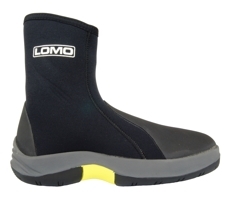 The Lomo Aqua boot is a fantastic boot at a phenomenal price. Glasgow based Lomo Watersport has added a new product to its range - a 2mm neoprene vest designed to boost warmth levels of any wetsuit. The vest, made of stretchy 2mm neoprene with flatlock stitching to remove uncomfortable seams, can be worn under you existing wetsuit, whatever its thickness and gives additional insulation around the most important part of your anatomy - your chest area. 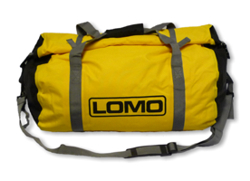 I took the Lomo Watersport vest on my recent trip to Egypt for Camel Dive Club's 20th anniversary celebrations as the Red Sea in December can be a little on the cold side, particularly when you get out of the water and hit that wind shill! I put the vest on under my 4/5mm Ralf Tech Storm Power semi-drysuit and the two together kept me as warm as toast on multiple hour long dives. 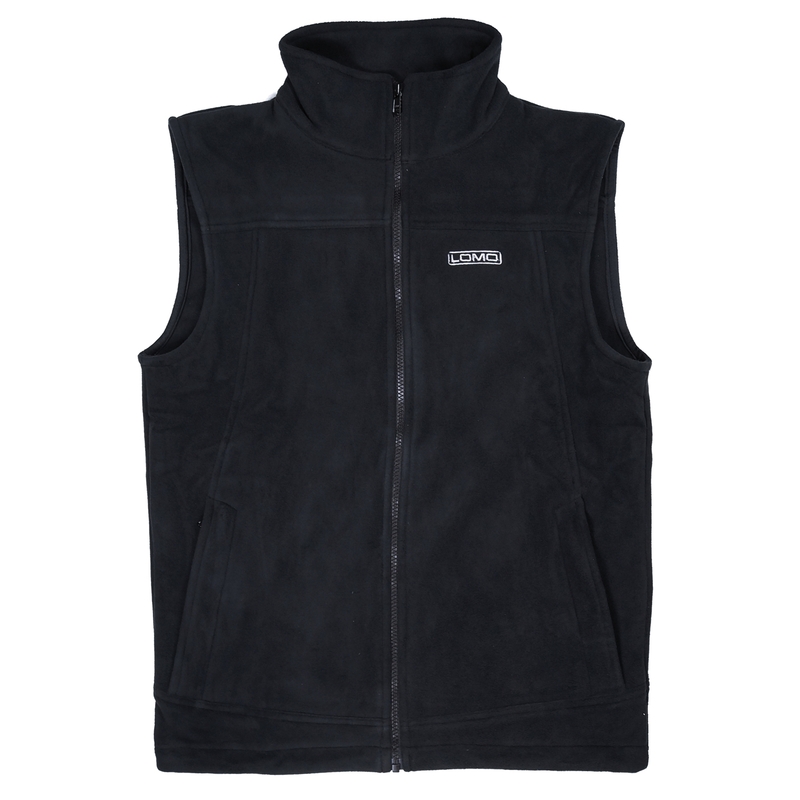 I tried one dive without the vest and the difference was noticeable - it may only be 2mm thick but as it fits tightly around your core, it does add additional warmth where you need it most. Best of all, its light weight means it takes up no room in your bag and it dries very quickly between dives. MARK: The first thing which hits you about this mask is its sheer size, but once on your face it doesnt feel to heavy or awkward. DAVE: It's huge, but it fits very well. It's got excelent vis, as you would expect from such a big mask, and its surprisingly easy to clear. A snip at that price. ANDREA: A bit large for me, but not too bad, you can see a lot and its very easy to clear for such a big mask. RICHARD: Nice soft silicone, it fitted well and its got excelent vis - not my favourite, but a good mask at a great price. SHARON: Its massive, but it fits really well. You can certainly see a lot out out of it - and for a big mask, its pretty easy to clear. JOHN: Good all round vis, particularly down, and you can clear it from a full flood in one go. Nice mask. 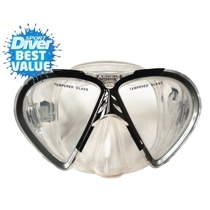 THE MASK WAS AWARDED THE SPORT DIVER BEST VALUE AWARD AGAINST 10 OTHER LEADING RIVALS! When I was told how much this drycag sells for I thought there must have been a mistake; at only £87 the Lomo Evolution Drycag is an absolute bargain.and performance wise comfortably holds its own against its more expensive rivals. 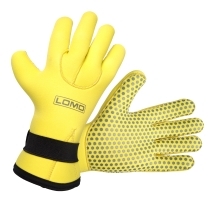 The Evolution is available in both yellow and grey, the grey version is a direct response from Lomo whose customers had been asking for something a little less bright. the new grey and black version has a minimal design which looks good. The reflective piping is a nice subtle addition along the sleeves. well subtle until you shine a light on it in the dark anyway. The material is 3ply and breathable. It's quite a stiff strong feeling fabric and feels similar to that of the Yak Celsuis. It fits generously for its size and feels comfortable when on. It proved to be dry and warm in all the situations we threw it and ourselves into. The inner waist is long and thin and tightened by a draw cord. The outer waist is tightened by pulling two large D shaped velscro tabs around the sides towards the front of the cag. The outer waist is rubber coated on the whole of the inside, helping it grip a spraydeck tube beneath very well. The wrist seals tighten with velcro, leaving the sleeves of the cag overlapping the latex cuffs well. There's a good tab for easy release. The neck is treated in a similar way, with a latex seal being protected by an outer collar that it tightened at the front. The outer neck isnt very tall but it can get in the way a bit and get under you chin; this can be remedied easily enough by easy adjustment. 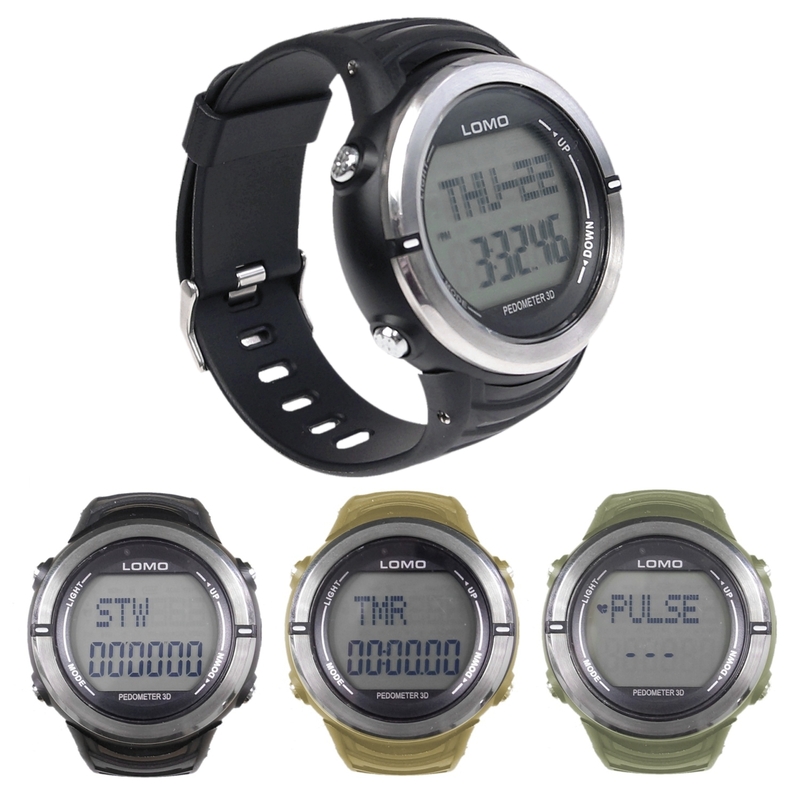 Best Value Cag:- A Category where at last we all agreed - the clear winner, The Lomo Evolution; a top which out performs many drycags that cost a hell of a lot more. It doesn't seem very long ago that strutting around the 'get in' carpark in a drysuit was enough to incite envy and lust in other paddlers who were shivering as they changed in the morning frost. I remember watching, open mouthed, as a friend of mine unzipped his drysuit, stepped out of it clad in warm dry thermals, slipped on a pair of jeans and was instantly ready to do the shuttle run. I wondered if I'd ever be dedicated enough to save up for one of these crowning pieces of kit and whether it would actually be worth it, seeing how bulky and awkward they looked to wear. Each year brings improvements in kit and the rivers can end up like fashion parades with paddlers wearing this seasons' new colours. I've got my fingers crossed that this seasons colour will be red as I recently got my hands on a new Lomo dry suit, the Tornado mk2. The Tornado is incredibly good value for money and retails at just £175. This makes it cheaper than some dry tops on the market, and for this price you get the whole suit! Quality wise, there are certainly no complaints. It's held together with good stitching and glued seems. Despite being treated roughly my suit stills looks, and smells like new! The Tornado mk2 is made from three layer hydrophobic material, so the whole suit is breathable, not just small panels that can be covered up. The knees and seat areas are strongly reinforced, so you would'nt have a problem scrambling up rocks, climbing through bushes or sliding down river banks. 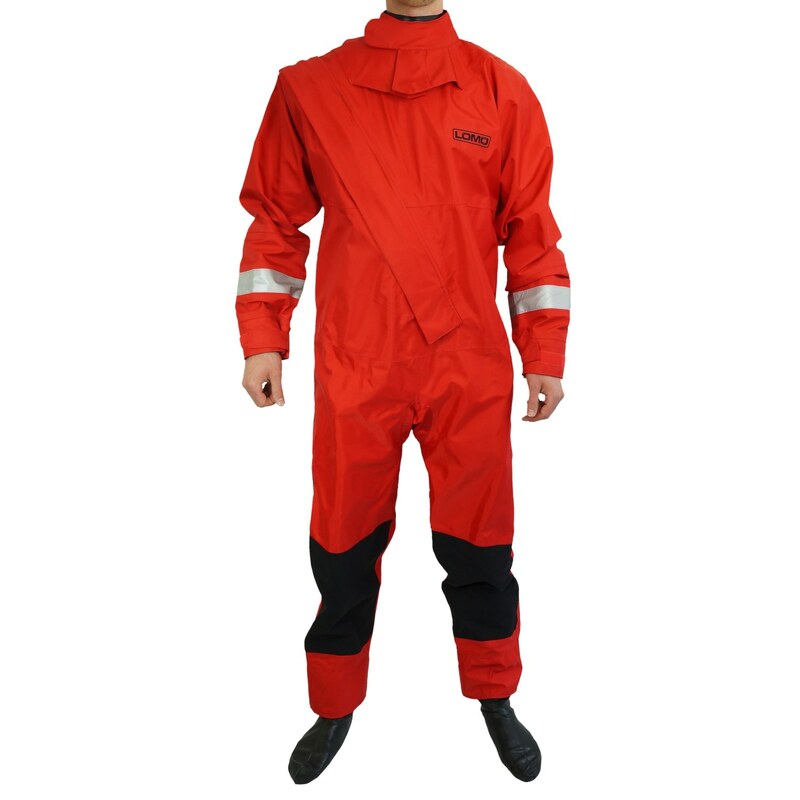 Overall, the suit feels robust and resiliant yet when worn it remains flexible and supple. The elasticated waist and internal braces keep everything in place. The diagonal zip across the front inhibits comfotable movement slightly, but I found that this was reduced when I put my BA on. Some people prefer a zip across the back shoulders, but in this position I could happily do up the zip without any help. The zip itself is a heavy duty waterproof zip that is then protected by a velcro closing storm flap. A little beeswax on the zip helps keep the movement effortless, a tip I was given by a diving friend of mine. The neck and cuffs have the usual style conical latex seals which are thick and of good quality. The neck seal has a Velcro closing collar that protects it, which I did find rubbed a little against my neck, before careful adjustment. The cuff protection can be adjusted perfectly for a nice snug finish. The suit has latex socks which I prefer to ankle seals. The makes for less struggle getting into and out of the suit. The socks are big enough to fit a pair of fleece socks in and small enough to fit into river shoes without lots of annoying loose latex getting in the way. Again the latex in the sock is thick but its always worth being careful if your wandering around and getting changed. There's no pee zip which I haven't found to be a problem yet. If it becomes one, I'm certainly not going down the same road as our ex club chairman - apparently you have to roll afterwards so you can get both feet to warm up! Overall, I've been very impressed with this suit. It's tough, comfortable and warm. It's full of features, that have been carefully thought through and which work well. It's amazing value for the price you pay, but please keep it quiet, I want a few heads to turn when I join this winters' riverside catwalk. ..."As well as incorporating the same excellent lower back system as the shorts, the trousers extend all the way down to the ankles, giving full leg coverage. 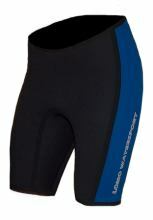 They also have added protection on the knee/upper shin and come in slightly thicker 3mm Neoprene. Warmness rating - during the Hurley sessions a prebent trouser clad tested noted that he was the warmest he'd been in a long time! Praise indeed! River running - When not wearing dry trousers, we always end up continously pulling our shorts up, after getting in and out of the boat especially; ;uckily for us there's none of this with these trousers.... no Sir! Ditching the dry trousers in fabour of these is definitely an option on days where its just too cold for shorts; Hurley on 0 degrees for example. The one thing we've always hated when wearing wetsuit shorts is the annoying cold strip which appears on your back, between your cag and shorts, after you've sat in your boat and your shorts have ridden half way down your bum. This couldn't go on..... fortunately for us the Lomo 'pre-bent' cut is exellent; the neoprene is cut to sit high on your lower back, just under-lapping the cag; it hardly budges when you sit down or even bend over (dont ask). the shorts fit snugly around the groin and down the leg. Warmness rating - this is a slightly unfiar comment, but fairly obvious.... in the arctic testing grounds of 0 degrees Hurley, we found the shorts weren't quite enough! * However, we are confident that in slightly warmer conditions, ie above freezing, the shorts would do just marvellously." 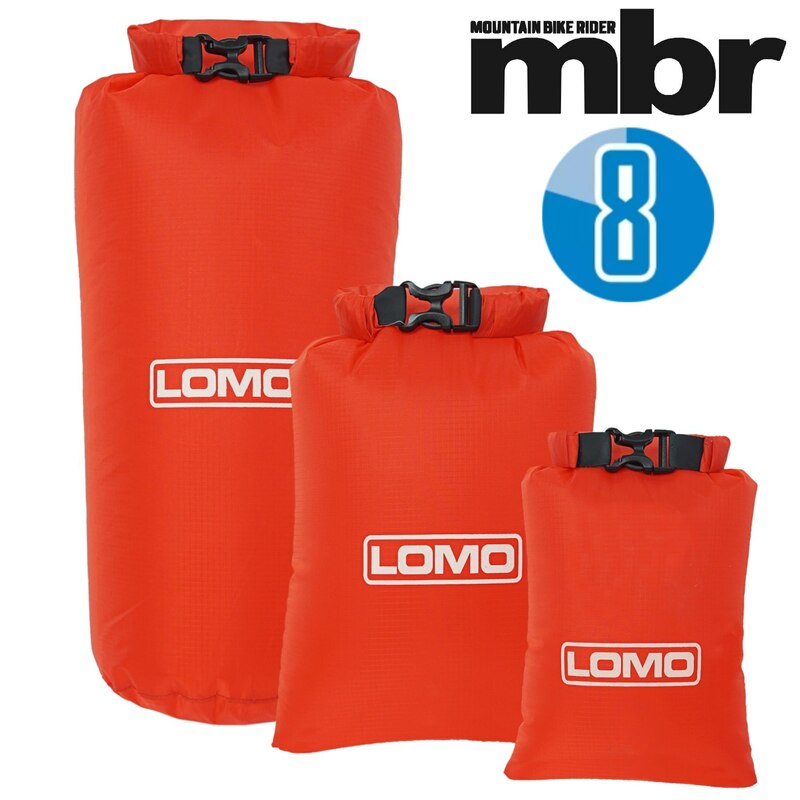 "Lomo also sent us a sample of their new dry bag range. the bags are standard 'roll top' sealing type, with a rigid plastic rim rolling down upon iteself to clip together, forming a fairly dry seal.... good enough to keep the contents 100% dry sitting inside your sea kayak hatches; being thrashed around in the back of a swamped creek boat in a stopper would certainly dampen the contents but that just serves you right for swimming. The bags are made of hard wearing black material with a plastic viewing panel. They come in a range of sizes from 5 to 100 litres and ....well that's it. Dry bags are boring by definition, lets not fool ourselves. The particularly interesting thing about these bags is the price; they range from £4.50 to £11, ridiculously cheap! 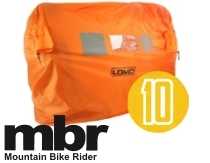 ...."Another interesting new line from Lomo is their dry bags - heavy duty quality, sizes from 5L up to 100L, and prices from £5.25 up to £15 for the big boy. they feel of a heavy quality and come with a quick release strap. A thick flexible band of plastic seals off the mouth of the bag from the elements. I tested it on a wet RIB on a wet day and my clothes and sandwiches stayed completey dry. This is a top quality product that i would recommend to anybody." 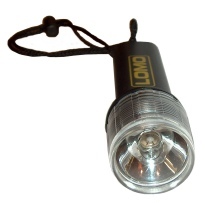 "The Lomo DL1 torch is a nice little unit and its a nice little price at only £6.50. diving equipment at a reasonable price, that's a nice idea! 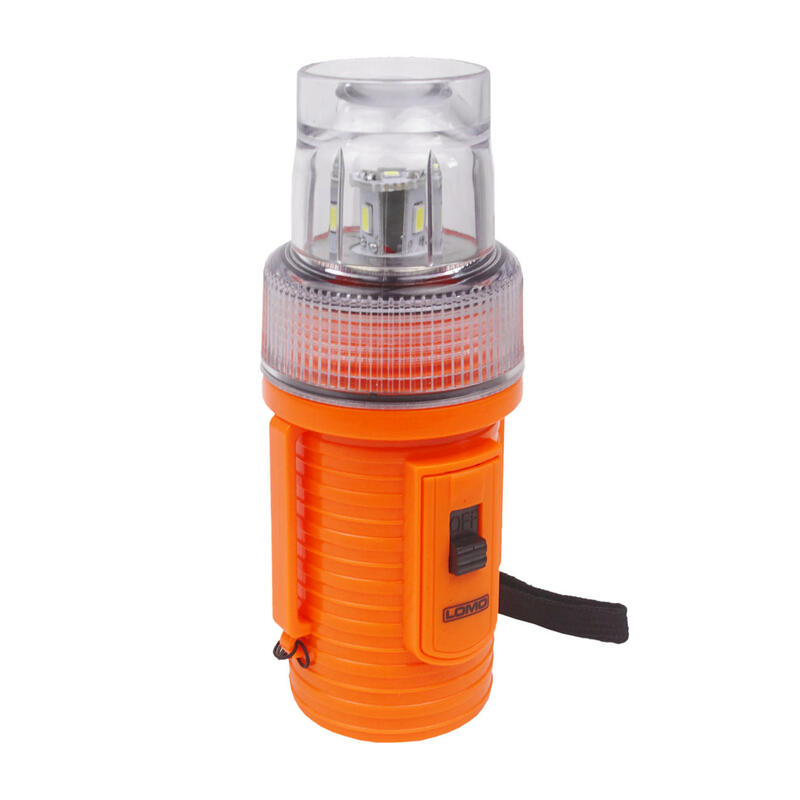 The torch is rated to 40M and has a double 'O'ring seal. Operation of the bulb is by rotating the clear lens bezel unit. It is small but it feels solid and is supplied with a Lanyard as well. Dont expect any LEDs for this price but the buld does supply a nice bright hot spot. Its ideal for attaching to a mask strap for reading guages at night or as a spotting light for a camera. I used it for my camera and was impressed with the results. It gave a bright beam that was wider than the torch I had been using. The torch performed great down to its max operating depth. I did however manage to let some water into the unti on a subsequent dive turning the torch on at the surface. The 'O' rings look a little thin and the bezel jumped a thread as I tightened it up. whilst this was user error on my part I would recommend that with this torch its best if its turned on before you enter the water. A RECENT trip across the border to the Farne Islands was the perfect trip to try out a new pair of fins. Lomo, the Glasgow based company is distributing a power split fin which is produced for Lomo by IST, and I first noticed these fins while flicking through the pages of SCOTTISH DIVER. I was impressed! 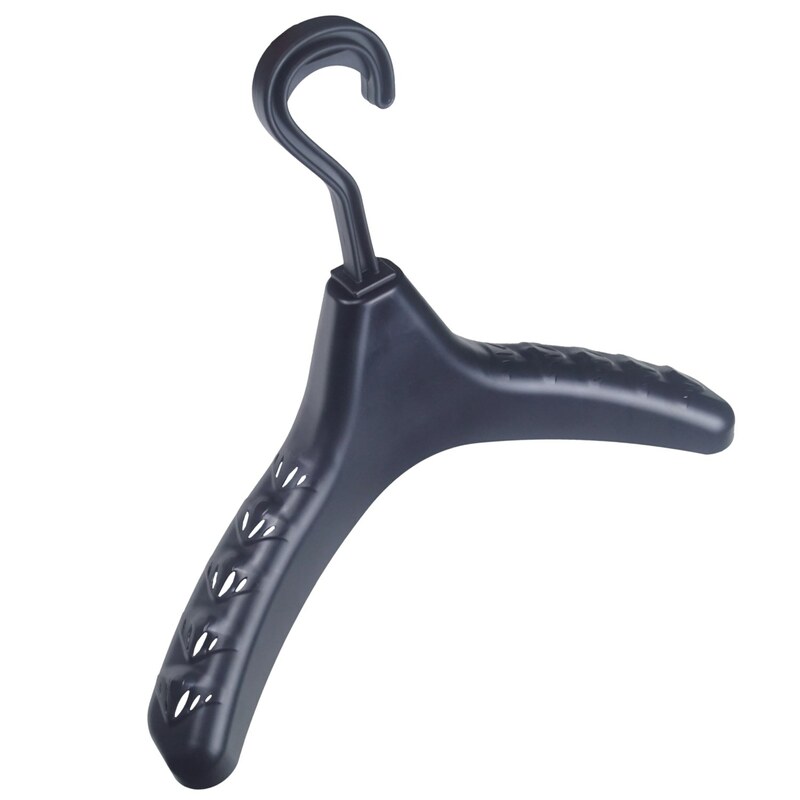 A fin for under £50 that incorporates the patented 'Nature's Wing' split fin design. It sounded too good to be true. Up until recently I had been using Mares Avanti Quatro fins and after a slow start, I had been getting to like them. These fins, a popular choice by many divers, are widely regarded as being the best non-split fin style fins available. They make an excellent high quality bench mark for comparison with the Lomo fins. I've got size 10 feet and I found I needed the XL size in the Lomo fins which is exactly the same as the Quatros. (This is what I agreed on the phone with Lomo but watch out if you order over the net as it states size 10 - large) I found that size too small even with wetsuit boots. The Lomo fins are made out of rubber and the quality is excellent. The foot pocket is comfy and sturdy and its base runs right up the length of your foot. The quick release buckles are a joy to use. 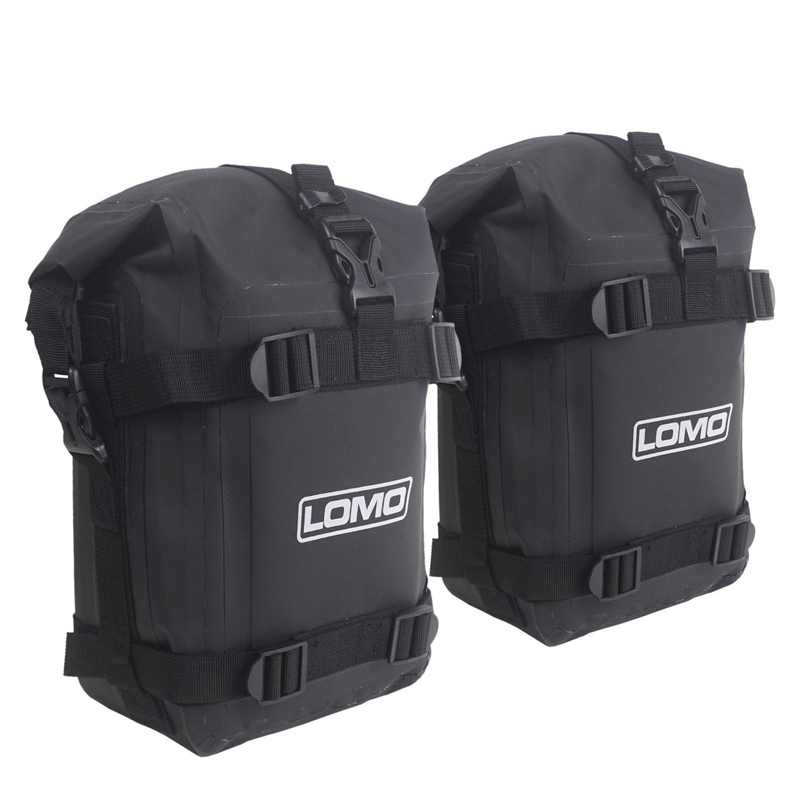 The Lomo units look like standard units but they have raised lobes on the quick release buckles which made removing the strap a one handed operation, even with numb fingers. The strap is standard but has a nice loop to assist in getting the strap over the heel. In the water, they felt strange initially. It seemed as if I had nothing on my feet, which was great, as I was certainly moving forward as I finned. By the end of the first dive I was really getting used to them, and I agree with what the manufacturers say 'excellent propulsion for very little effort'. This suited my style of diving perfectly as I generally use a frog kick to propel myself. If you are moving from standard fins using a standard straight leg kick, you may take a little longer to get used to them. In the stiff tide of a gully on the Knivestone, I was interested to see how the fins would perform with a bit of tide to contend with. With the Mares fins, you get out what you put in, so if you find yourself in a tide, and are fit, you can power through it even though the effort may be exhausting. With the Lomo fins I felt the result a bit different. When the tide got up and extra effort was put in, I found I got forward propulsion but it felt as if my extra exersion was beating the fin. I dont think you have to put in a big effort to get the best out of these fins. I made good headway along the gully with the Lomo fins, perhaps not as fast as with the Mares fins on but certainly not having to put the same high levels of energy into each fin stroke. In conclsion, I liked the product. I thought it was well made and I really liked the straps and quick release system. The fins appear to be very abrasive resistant and after the first few dives showed no damage at all. Performance wise, I thought they were excellent but that may be because they suit my style of diving with the cameras. They were very easy to use and once I got the hang of them, I could keep myself in the precise position whilst focusing throught the viewfinder. So, should you ditch your current fins and go out and buy yourself a new pair of Lomo fins? I certainly found great benefits from the Lomo fin and the split wing design. You get a lot of propulsion whilst putting in far less effort than with conventional fins. It truly is like having nothing on your feet. Compared to the top end conventional fins like Mares Avanti Quatro I did feel like the Mares fins can push you through the water more quickly although at the expense of a larger effort. I found the Lomo fin to be a quality product, and importantly, at £49.99 they represent excellent value for money. Online shopping is becoming increasingly popular with divers, but does it really give value for money? Lomo is an online company which started in 2000 selling a single product - the 5/4mm Tsunami wetsuit. DIVE tested it then, and after many dives its still in reasonable shape, so we can certainly vouch for its quality. 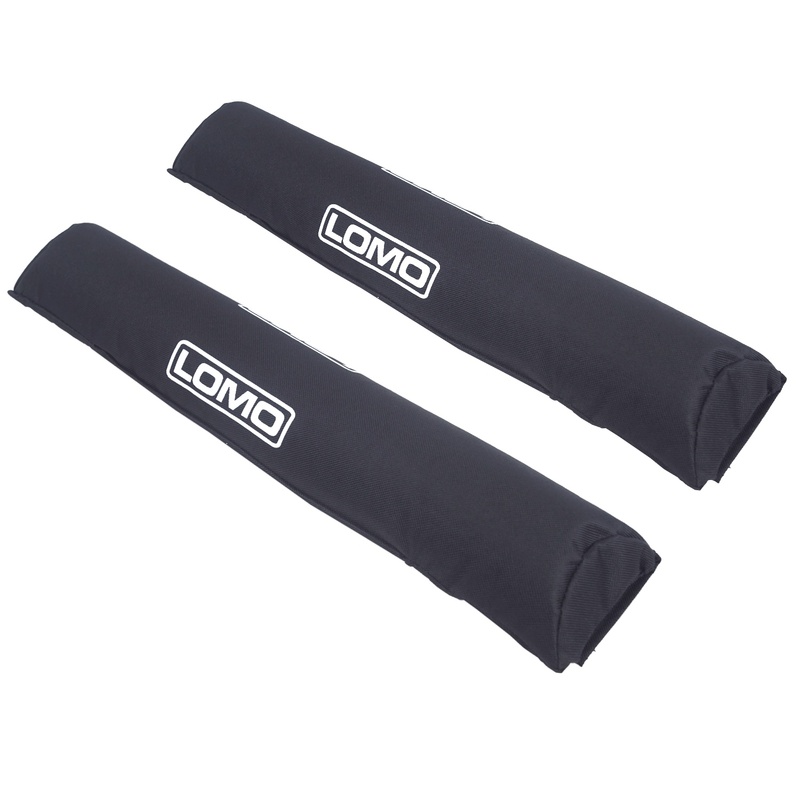 Today, Lomo has expanded its product range to include neoprene wetsuits, hoods, socks and gloves, titanium diving knives, dry boxes, drysuit seals and other diving accessories. Reassuringly the company offers a 14 day moneyback guarantee. Simply return the product to Lomo in its original condition and the company will send you a refund for the full amount - you can't say fairer than that. Lomo's latest product is a flatlock stitched 3mm shortie. It features a YKK zip and has fine mesh neoprene on chest and back. This is an ideal suit for pool training or in warm overseas waters and at £35 is pretty good value for money. A word on the sizes; they tend to be on the small size, so order slightly larger than the chart suggests. (NOTE: THIS HAS BEEN CORRECTED SINCE THE REVIEW. THE SIZES ARE NOW CORRECT). In this section of Scottish Diver I continue my recent theme of bringing to your attention great high quality products that are sold at low, reasonable prices. 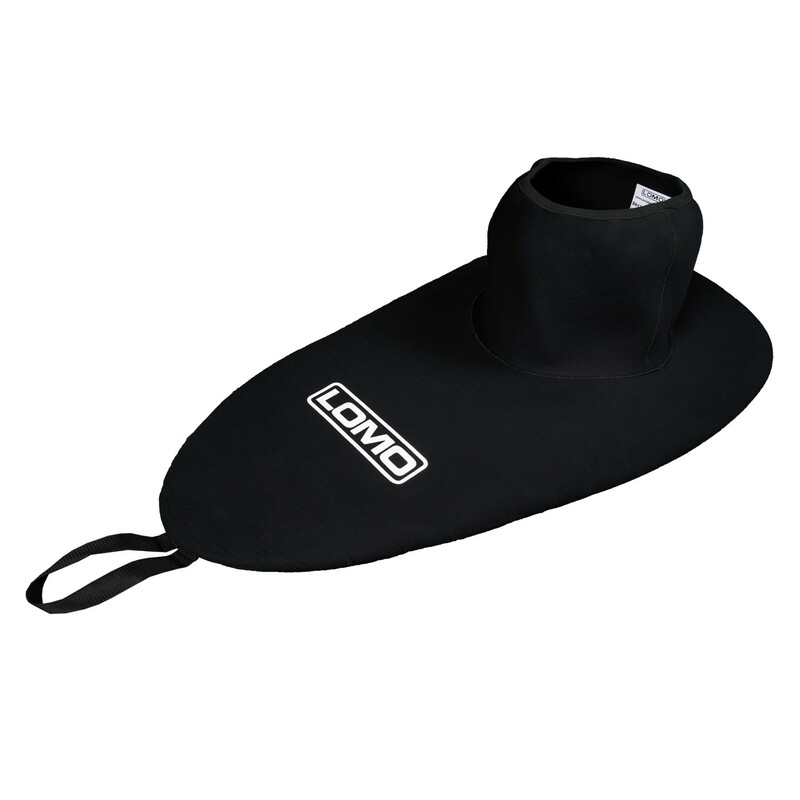 Lomo is a Glasgow based firm specialising in watersports gear and wetsuits. They have been around for a few years now and I have reviewed a few of their products. In fact it would be fair to say that they produce my favourite piece of kit! My bright yellow 7mm dive hood which will keep me warm right through the winter. 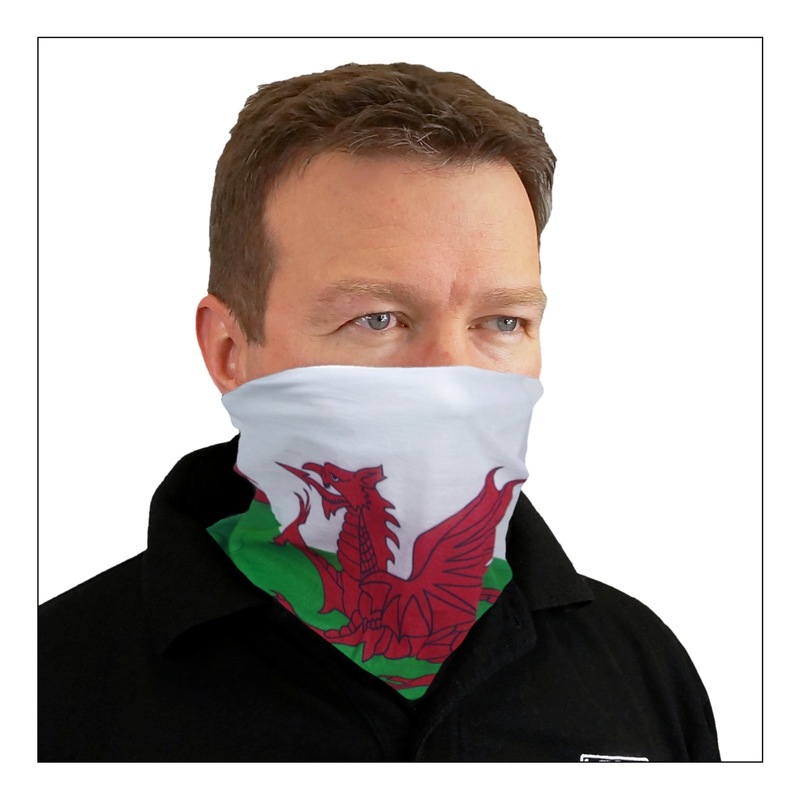 They have now added a range of masks to their range of dive kit. there are around 8 masks starting at £18 and this is for a mask with a high quality silicone skirt supplied in a nice strong mask box! The vast majority of masks are priced round £20 with only one, the Alumino, toping £32. Top of the range and less than half the price of similar masks from the big name suppliers. I was sent 2 masks by Lomo to try out and here's how I found them. I was drawn to this mask because of its black silicone skirt. I prefer this when working with the cameraas it reduces all those reflections in shallow water. This one's frame had an interesting design and it certainly fitted my face well, the skirt made a great seal. 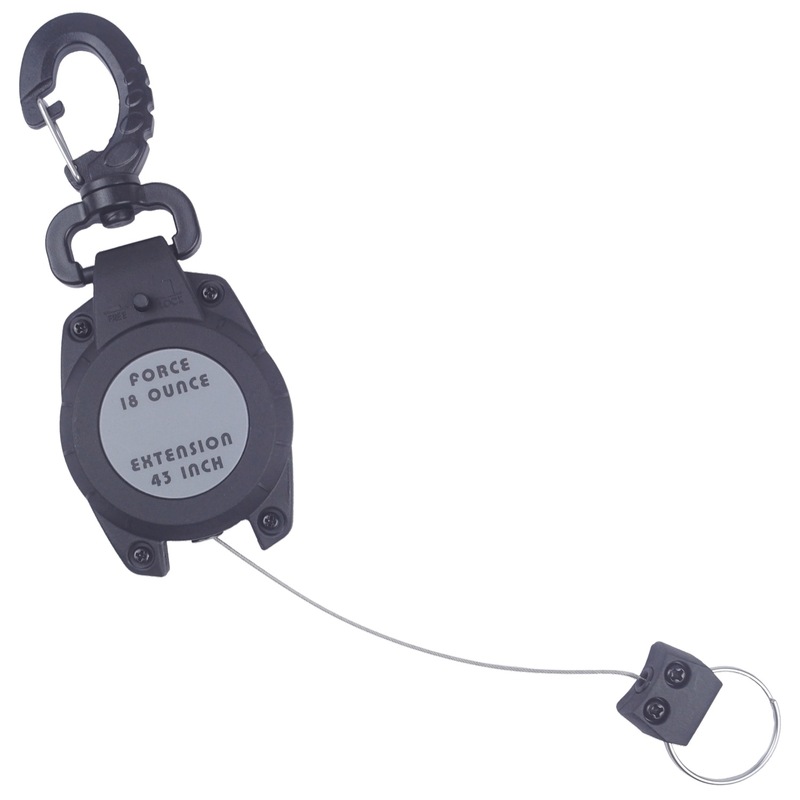 Buckles and straps are fairly standard and are easy to use. This one came with a clear skirt and it bore a striking resemblance to my Cressi Sub Matrix Mask. The feel of the silicone skirt was very similar. In fact the only clear difference was that I paid quite a bit more for the Matrix. Once again the straps and buckles are standard and easy to use. 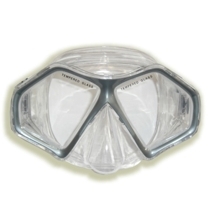 Choosing a dive mask is a matter of personal choice as everybody's face is different. All I can say is the two masks fitted my face like limpet mines, and the nose pockets comfortably encased my nose. If you are in the market for a new mask I would reccomend you take a look at Lomo's website (www.ewetsuits.com) as the masks are on clear display there, or if you are based in Glasgow pop in and see the guys.